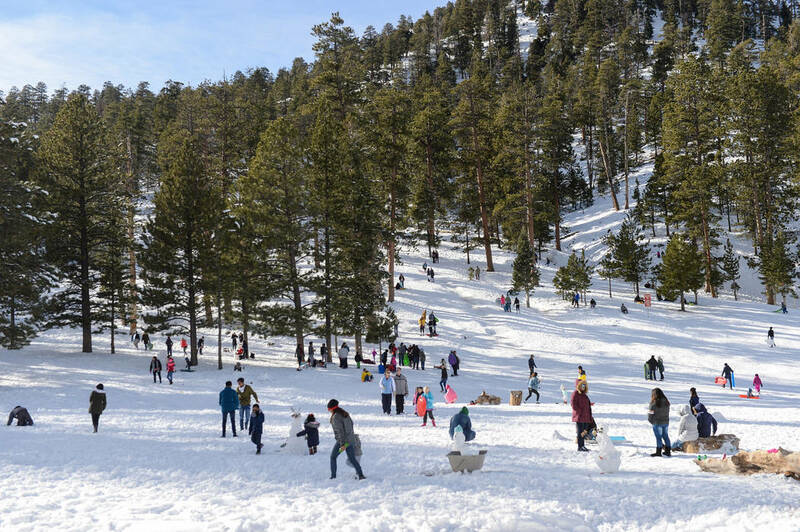 Kids aged 4 to 12 are invited to participate in ski and snowboard competitions Saturday at Lee Canyon. Special to the Pahrump Valley Times Lee Canyon will host competitive ski and snowboard events for kids Saturday. Anyone under 12 can compete by purchasing a single-day lift ticket to the resort and registering by 10 a.m. The Lil’ Air and Lil’ Air N’ Style competitions will be held Saturday and again Feb. 23. The competitions are the culmination of Lee Canyon’s four-week Mountaineers and Freeriders youth programs, and registration is free for program participants. Mountaineers is a skier-only program for kids ages 3 to 6, while Freeriders includes skiers and snowboarders aged 7 to 12. Youth not enrolled in the programs are eligible to compete by purchasing a single-day lift ticket, which may be purchased online at a 25 percent discount. Competitors must be registered by parents or guardians by 10 a.m. on competition days. Lil’ Air focuses on beginner jump skills, while Lil’ Air N’ Style kids demonstrate skills on beginner jump and jib features. Participants not enrolled in Lee Canyon’s youth programs will be in a separate division. Race categories are based on sport and age, with skiers 7 to 12 at 11 a.m., snowboarders 7 to 12 at 11:45, skiers 6 and under at 1 p.m. and skiers and snowboarders 4 to 12 not in the Mountaineers or Freeriders programs at 2 p.m. The criteria by which competitors will be evaluated include race style on regular terrain and execution of a beginner jump and jib specifically designed for youth. All competitors are entered to win a GoPro camera and other prizes.